Situated at the entrance to the exciting V&A Waterfront, the Southern Sun Cullinan Hotel offers views of Table Mountain, the bustling harbor, the Waterfront and the city. 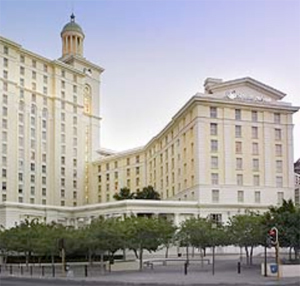 The hotel complements the rich, cultural heritage of Cape Town with a timeless architectural tradition. Every aspect of the hotel denotes the special care that it offers in providing guests with efficient and discreet service. Elegance and style is evident in the marbled foyer, with its majestic columns and lavish decor, rich furnishings and intricate metalwork. The guest rooms are spacious with luxury bathrooms, and offer views of either Table Mountain or the Waterfront. The Southern Sun Cullinan Hotel provides a full range of services – from the elegant breakfast room and a la carte restaurant, to the ladies’ cocktail bar. For the health conscious, the hotel has its own gym and for those who prefer a fresh water dip to the cold Atlantic ocean, the outdoor pool is ideal.